Going cross-platform, staying native or going cross-platform while staying native? Sounds terrifying enough even for those who get the hint of what this all is about. Hard to imagine what chaos it can create in the mind of someone who simply wants to develop a neat mobile application. Engaged in both native and cross-platform mobile development, ScienceSoft did its best to unscramble the logic behind the process of choosing the right option for your application. 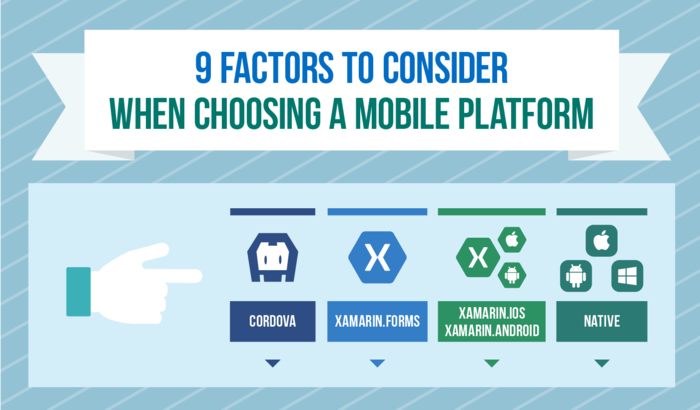 To determine the pros and cons of native development and cross-platform tools such as Cordova, Xamarin.Forms or Xamarin.iOS/.Android, we considered the 9 most influential factors. No matter how excellent cross-platform development may get in imitating nativity, it’s still not native to the core. Only 100% Android/iOS/Windows Phone applications have the highest FPS rate and platform-unique interface. However, developing separate UIs for iOS and Android in corresponding Xamarins is a good way to improve user experience. Video/audio channels are probably the most whimsical parts of any mobile application. To be on the safe side and make sure that apps will show their best behavior, you should choose either native or Xamarin.iOS/.Android development. While it sure isn’t a problem for a native application, for a cross-platform one it is a major challenge to get in contact with the platform’s specific hardware. However, Xamarin has victoriously overcome it: applications that are developed in Xamarin.Forms or Xamarin.iOS/Android easily connect to all devices’ hardware. As you have probably already noticed, Xamarin is pretty successful at catching up with native development in many aspects and presents a solid competition to it. Thanks to this framework’s powerful libraries and the out-of-browser operating principle — in contrast to Cordova — Xamarin applications have no network access limitations. Maps involve both image processing and connection to GPS. So, it’s only a framework that grants relevantly high frames-per-second rate and easy hardware access that can create such an application. Judging from our experience in Xamarin development, we can assure that this framework is as competent in creating applications with perfect maps integration as native development tools. In the context of cross-platform development, any application’s performance is driven by its basic operating principle. Cordova application, which operates within its own invisible browser, has a great number of limitations and will hardly be capable to support any intricacies, whereas Xamarin helps to develop applications with near-native functionality. If your major requirement for an application is the ability to integrate with ERP or CRM, then your options are not limited. In fact, you shouldn’t be worried at all: be it a native, Cordova or Xamarin application, an easy integration with business tools is guaranteed. We always pay more for more power and possibilities. Since Cordova presents a browser wrapper, it is best suited for development of simple applications, and, being open-source, is your cheapest option. With Xamarin, on the other hand, you have more freedom and — a mandatory license fee. Moreover, if you want to tailor the UI to iOS and Android with Xamarin, the costs will rise even higher due to the need to test a bigger chunk of code. But naturally, separate development of native applications for all the three platforms will cost you the most. Android, iOS and Windows Phone will most likely be out there forever, so with them there’s a 0% risk for long-term investment. Cordova is officially supported by SAP and the open-source community, which gives you the feel of confidence in the future, as well. Xamarin, however, is an endeavor with amazing work performed so far, yet an indeterminate tomorrow. It will be possible to speak about more definite future in case the negotiations of Xamarin being bought by Microsoft will be successful, but until then — development of a Xamarin application that you are planning to promote on the market for the next 3 or more years, may appear a gamble. From all what we have seen, it’s clear that the choice of the mobile application development method depends on the compilation of factors rather than on one or two of them. In order not to take risks, a good decision is to seek for professional help. Offering mobile consulting services, ScienceSoft specialists have a keen eye and are able to advice the development option that your application will benefit from the most.